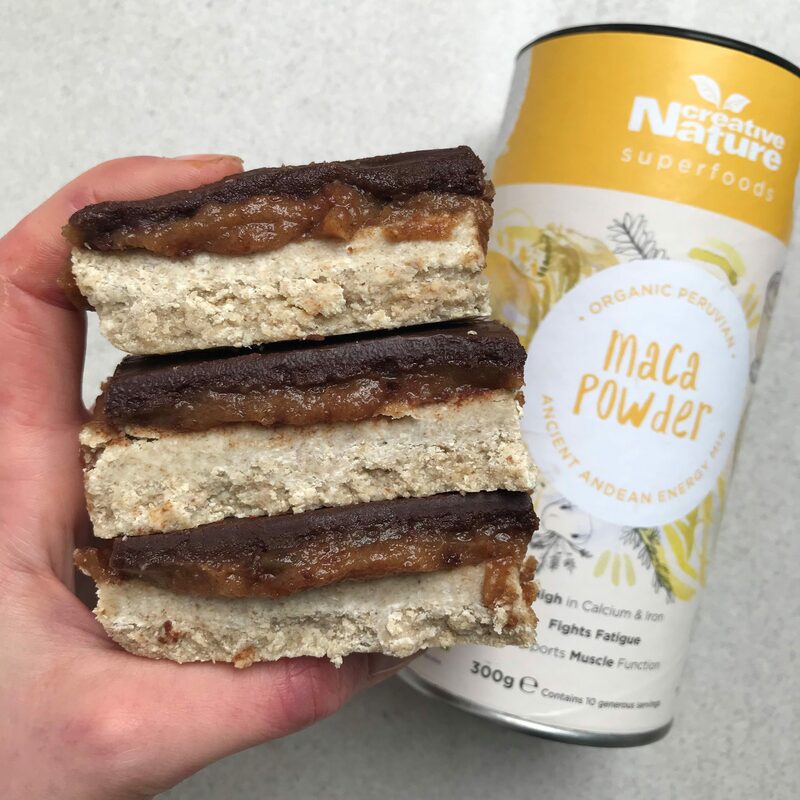 If you love the traditional Millionaire Shortbread, but want to make one yourself that is vegan and delicious, try out this yummy version featuring our Maca powder! You won’t want to share…it’s that good! Start by lining a square baking tin with grease proof paper – this will make it easier to pull out the slab at the end. Add the oats to a blender and blitz until they form a flour. Add the remaining shortbread ingredients to the blender and blend until the mix starts to come together. Transfer the mix to the lined baking tray and spread in to an even, compact layer. Pop in the freezer to set whilst you make the maca date caramel. Add all of the caramel ingredients to the blender along with 3 tbsps warm water. Blend until smooth – you may need to add a little more water. Once smooth, remove the base from the freezer and spread over the caramel in an even layer. Return to the freezer to set whilst you make the chocolate. To make the chocolate topping, add the coconut oil or cacao powder to a small pan and set over a low heat to melt. Once the coconut oil has melted, stir in the cacao powder, maple syrup and tahini until fully combined. Remove the shortbread from the freezer and pour over the chocolate, spreading in to an even layer. Return to the freezer for a final time to set for 1 hour. Once set, remove the short bread from the freezer and allow to thaw at room temperature, before cutting in to 12 equal slices. Enjoy! Thank you to Yasmin (blog here) for this recipe!